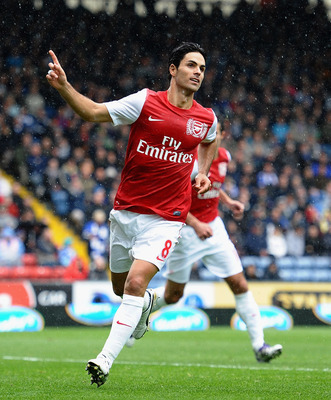 You are here: Home » Blogs » How important is Mikel Arteta to Arsenal? Posted by: supreetkini on February 17, 2012 in Blogs, Guest Writers Comments Off on How important is Mikel Arteta to Arsenal? Crisis was looming large over Arsenal Football Club in the month of August 2012. The club had sold Francesc Fabregas to Barcelona for £35 million. And, after a 2-0 loss to Liverpool, Arsenal gave away to immense pressure and parted with French midfielder Samir Nasri. What conspired was completely unexpected and humiliating. Arsenal travelled to Old Trafford with a squad on the brink. Alex Song, Gervinho and Emmanuel Frimpong were all suspended for the big clash. Moreover, the squad was crippled with injuries and low on confidence. And, they got humiliated 8-2. It was the lowest ebb of Arsene Wenger’s reign at the club. But, it sparked Arsenal’s involvement in the transfer market. Previously, the Gunners had bought in only 18 year old Alex Oxlade Chamberlain, an unproven youngster for a whopping £12 million from Southampton; Gervinho, who had starred for Lille in their French League triumph, for almost the same amount, and little known Carl Jenkinson for £1 million, who was a reserve right-back from League One side Charlton. On the final day of transfer dealings, Arsenal bought 5 players, all with some pedigree. There was the German centre-back with bags of experience, at both club and international level, Per Mertesacker for £7.9 million; South Korea captain Park Chu-Young for £3 million; Brazilian left-back Andre Santos for £6.2 million; Israel captain Yossi Benayoun, who was usually on the fringes at Chelsea, and finally, Everton midfielder Mikel Arteta for £10million. Now, mind you, there was a lot of initial criticism about Arsenal signing Mikel Arteta. Arteta, earlier in his career was a football nomad. Having started off with Barcelona’s B team, he tried his luck in French football with Paris St. Germain, Scottish football with Glasgow Rangers, and back in Spain with his boyhood club Real Sociedad. The big move of Arteta’s career came when Everton came calling in 2004. Arteta had a mixed time with Everton. In midfield he was usually partnered by Australian Tim Cahill, a young Leon Osman, and Kevin Kilbane. Arteta was one of the first names in David Moyes’ team sheet. He had built up a reputation in the Premier League to be a polished midfield player. It was something which Everton had lacked for a long time. Even though Thomas Gravesen and Lee Carsley were formidable, Arteta and Cahill bought about a freshness about Everton. They were more of a attacking side than a defensive unit. The club had moved on from being a team that amassed 1-0 wins, to a team that could conjure up goals on their day. What helped Arteta blossom at Everton was not only the partnership with Cahill, but also the help he got on the wings, with players like Steven Pienaar and Leon Osman. Now, Everton, with all due respect to them, are a mid-table team. Even though everyone has Everton as their second-favorite team (including me), the lack of funds at Moyes’ disposal bogged down the club making that step up in the level, which meant Everton had to content with mediocrity. Arteta, himself, who had groomed himself to be one of the best midfielders in the country, received national interest even from England, as he had worked enough years to qualify playing for England. The call up didn’t arrive however. Arteta finally got a call from a big club, and a chance to strut his stuff with the elite in Europe, when Arsenal came knocking on his door. He obliged and now he turns out for Arsenal. Its has been nearly 6 months since his arrival, and I present my views as to how important Mikel Arteta is for Arsenal, listing some of his football attributes. So, what position does Mikel Arteta operate in midfield? Arsene Wenger’s 4-5-1 formation sees Arsenal operate with a 3 man central midfield. Alex Song, is the defensive midfielder. Mikel Arteta is the playmaker, while Aaron Ramsey/Tomas Rosicky is the attacking midfielder, with most forays into the opposition defence, done by them. Mikel Arteta is adept at his position. He can not only perform the role of Alex Song with relative ease, but also that or Ramsey/Rosicky with no qualms. He forms a perfect adhesive to the midfield unit, and helps in constructing build up play. This is one of Arteta’s best footballing attribute. He has grown into one of the best midfielder’s in the continent with his passing ability. Arteta is a clean passer of the ball, and unlike Ramsey rarely loses possession. Arteta has a wide passing range. This season, we have seen many-a-times Arteta do what Fabregas used to do, i.e the long pass to the pacy wingers. Arteta can release the ball from the deep to anyone on the wings, which, this season, has been usually Gervinho, Walcott and Chamberlain. Arteta has an astute vision. Though some may argue it may not be as sharp as that of Fabregas, or not as perfect as Paul Scholes, Arteta is blessed with vision. What Arsenal lacked in games against Liverpool and Manchester United earlier this season was vision. When Arsenal got hold of the ball in their own half, there was no one to spot a quick pass or a run. Instead, there was a Nasri/Ramsey/Rosicky who are more attack-minded. At the end, the attack would just be stifled out. Since the arrival of Arteta, that has changed. Now, there is a player who can quickly spot an outlet, and make the perfect pass to unlock defenses. I am a big admirer of Argentine midfielder Juan Roman Riquelme. This is because he can run the game as he wants it. How he does it is by having a brilliant reading of the game. He can not only orchestrate the perfect counter-attack, but also build up plays from scratch. Now, Mikel Arteta has trained himself to be that kind of player for the Gunners. He has the uncanny ability to control the tempo of the game, and make it fast-paced or slow it down, depending on the situation. Though this quality is one of the least talked in modern day football, where the emphasis is only on pace, it still is a vital ingredient that makes a midfielder successful. Aaron Ramsey is often accused of overworking himself, and always hasty to make the final pass. This has often been a criticism of many Arsenal players in the past. Now, Mikel Arteta has changed all of this. He brings with himself an air of calm, that is not only pleasing to the eye, but also extremely vital to the Arsenal side. His calmness in the centre of midfield has been Arsenal’s backbone this season. Arteta has had nearly 6 years experience in the Premiership. With every passing season, pace changes and so do styles. But, Arteta has adapted well to the changing demands of the modern game. His experience in a raw and young midfield is immense. He is surrounded by players like Song (24), Ramsey (21), Walcott (22), Wilshere (20), Coquelin (19), Chamberlain (18) and Gervinho (21), who are still in the early stages of their careers. And, with the departure of Fabregas and Nasri, the Gunners lost their biggest two influences in central midfield. Arteta’s experience makes up for those two losses, atleast to some level. Much has been written how good Xavi and Andres Iniesta are for Barcelona and Spain. It is all down to their high levels of technical ability. They pass the ball like no one else can. And Arteta brings some of that ability to the club. He is one of Europe’s foremost midfielders in terms of passes completed successfully. Though he is yet to score off a dead-ball situation this season, he was the dead-ball specialist during his time at Everton. While van Persie is the left-foot dead ball specialist, Arteta takes the free kicks more suited to the right-foot. Moreover, Arteta has taken the mantle of the senior players at the club. In a time of crisis, he along with Vermaelen and van Persie, have helped dig the Gunners out of a hole. Though the gap left by Fabregas and Nasri will be always be void, Arteta has been the Gunners’ best midfielder this season. Having settled well into a team that believes in the footballing philosophy of keeping the ball on the ground and passing, Arteta can be expected to hit new heights as one of the Premier League’s most gifted player. Coming to the question of how important Mikel Arteta is to Arsenal, I say Very. Arteta missed the games against Swansea and Manchester United, and his absence was felt clearly, as Arsenal went on to lose both. In both games, Arsenal struggled to keep the ball for many portions of the match, and never really managed to construct good build up plays, and were stifled by opposition midfielders in both games. When Arteta has played for Arsenal, his vital footballing qualities, mean Arsenal’s midfield is in good hands. Do share your views on this, by dropping a comment below.